This case study was developed as part of a two-month onsite engagement with a Latin American National Oil Company, dealing with data from onshore drilling rigs. The case study focused on 50 land rigs in one remote district, where data on productive vs. non-productive time was collected over 6 months. Comparisons were made between the non-productive time on the set of rigs that were using a structured, automated data capture system vs. those that required manual hand-entry of operating parameters in the field. Non-productive time was categorized using standard codes into four high-level categories and 24 sub-categories for analysis. The analytics showed that for the rigs using automated reporting processes, the regional field office was able to respond more quickly to downtime in the “Logistics” category, by providing backup and replacement materials and personnel, and by proactively optimizing transport routing to service multiple rigs in a single trip, instead of reactively responding to reported shortages. The analytics showed a 22% reduction in overall decision latency times for this category. The result was an average reduction in non-productive time due to logistics of 3 days per rig per month for the field operation over 6 months. By using the operating costs per hour for both locally and internationally operated rigs, the team was able to calculate that after an initial investment of USD $630,000, primarily in personnel and training costs, the return on investment for this project was USD $23 M in the first 6 months. In addition, there were benefits in rigs and personnel being able to spend more time on projects with lower risk and higher drilling success rates. 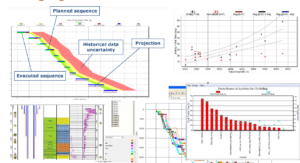 The next stage of the project was to develop a business case for reducing downtime in the other categories through the use of predictive analytics applied to depth-indexed and aggregated drilling engineering data, resulting in additional projected savings of USD $5.6 M.
Event report at: http://83a7383a5e33475eed0e-e819cda5edf0a946af164bb0b2f2ae3c.r0.cf1.rackcdn.com/DEJKL15day1report.pdf “.